Bring 2 cups water to a boil in a small saucepan. Put the chickpea flour in a large bowl. Gradually add the boiled water to the bowl with the chickpea flour, whisking constantly. Whisk vigorously to prevent lumps. Scrape the mixture back into the saucepan used to boil the water. Reduce the flame to a gentle simmer. Stir in 2 tablespoons of olive oil. Cook for just over a minute. Scoop the chickpea mixture onto the sheet pan. Spread it into an even layer. Loosely cover the tray with parchment or plastic wrap. Refrigerate for at least 30 minutes, or up to 24 hours. Put at least 1/4 inch oil in a large skillet over medium heat. Heat the oil to 250°C. 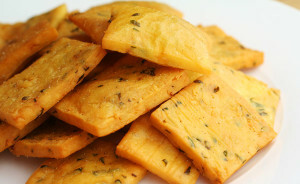 Cut the chickpea mixture into squares (about 1 inch X 1 inch) or rectangles (about 1 inch X 2 inch). Blot any excess moisture with a paper towel. Working in batches, gently drop them into the hot oil. Cook, rotating them occasionally until they’re golden all over, takes about 3 to 4 minutes. Drain Panelle on paper towels. Immediately sprinkle with salt and lots of freshly ground black pepper.